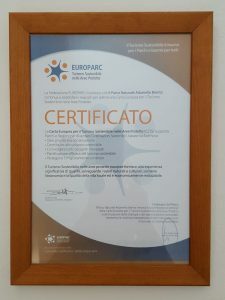 On 29 novembre 2018, the Adamello Brenta Nature Park obtained the validation of the Europen Charter of Sustainible Tourism for the third consecutive time. It was given at the prestigious European Parliament building in Brussels.The European parks awarded were 19, some for the first time, others for the second and only us for the third. The Park obtained the CETS for the first time in 2006, among the Italian pioneers of this project, revalidated in 2012 and has now been reconfirmed until 2022. Each time, various meetings were conducted, involving hundreds of local organizations, local authorities, associations, free citizens with rounds of meetings throughout the Park area. Interesting ideas have always emerged from the meetings that have enabled us to draw up very concrete program documents. Since 2006 the European Charter has been a tool for the Park to create a dense network of relationships and to implement ideas that later marked the entire tourist offer of the Park. Successful projects such as the Dolomiti di Brenta Bike and Dolomiti di Brenta Trek circuits or the “A Summer’s Park” notebook and the Park Quality business partnership project were born thanks to the Cets. Today there are over 40 IItalian parks awarded this award. Another 6 have currently started the accession process. At the European level there are over 120 protected areas in 13 different continents.